Excursion dans la Lune (1908) - Sci-fi-central.com. Georges Melies' best-known film, A Trip to the Moon, is inspired by Jules Verne's ''From the Earth to the Moon'' and H.G. Wells' ''First Men on the Moon''. 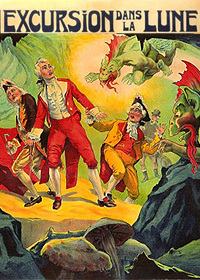 In 1908, Segundo de Chomon made An Excursion to the Moon, an imitation of Melies' work, which is preserved with the original Pathe Freres stencil color. The "trick" films of Georges Melies were extremely popular in their time, and inevitably they spawned imitators. Melies's most famous film, and probably his best, is his 1902 "Voyage to the Moon" ... inspired by Jules Verne's work, yet containing elements from HG Wells's novel "First Men in the Moon", published only the previous year. I've seen Melies's production sketches for that film: his lunar inhabitants (based on Wells's Selenites) were originally much more elaborate creatures, with lobster claws and complicated headpieces that never made it into the actual movie. Segundo de Chomon's "Excursion to the Moon" is virtually a shot-for-shot copy of Melies's opus: a strange decision, since Melies (notoriously a bad businessman) sold the prints of his films outright, so any exhibitor who wanted a piece of Melies's audience could merely buy one of the films rather than counterfeiting it. Many of the scenes in this "Excursion" are copied exactly from Melies's earlier film, notably a sequence in the lunar mushroom forest: one of the Earthmen plants his open umbrella in the lunar soil, and it instantly transforms into an enormous mushroom. The most famous image in all of Melies's films -- one of the most famous images in all of cinema -- is the two-shot sequence of his bullet-shaped spaceship hurtling towards the moon, then a crude cut to show the projectile striking the Man in the Moon in his right eye. For this remake (or rip-off), de Chomon seemed unwilling to copy that famous sequence precisely, so we see the Man in the Moon rather stupidly gawping with his mouth open for a protracted shot (much longer than in Melies's original), while it's obvious that the rocket is hurtling directly towards his gob-hole ... and of course it goes in. Melies's quick slapstick gag was more effective. Despite being a rip-off, this "Excursion" is in some ways actually an improvement over Melies's original "Voyage" ... notably in the opening sequence, employing a clever double-exposure to enable cartoon animation of drawings on a blackboard. Rather implausibly, we then see the spaceship being assembled by blacksmiths using anvils! Verne's original Moon novel (actually two linked novels) featured three astronauts (and some animals!) orbiting the moon without actually landing. Melies, for some reason, had six astronauts in his much shorter cinematic version, yet never defined them as individual characters. In this remake, de Chomon uses only five actors for the visitors from Earth, and the painted flats representing their spaceship take up a much smaller portion of the screen: definite improvements over Melies's version. Melies famously cast the Folies-Bergere girls as female cadets in tights, rather improbably using their dainty brawn to launch the projectile. Here, de Chomon casts a contingent of male soldiers for the same purpose: very slightly more plausibly, yet rather less pleasantly to the eye. He reserves his female performers for the moon itself, where they dance prettily as lunar ballerinas without ever actually doing any en-pointe work. Of course, the moon's atmosphere and gravity are identical to Earth's. Where "Excursion" clearly surpasses Melies's earlier "Voyage" is in the performances of the Selenites. Here, de Chomon casts some skilled acrobats who do some genuinely impressive gymnastics, including forward and backward handsprings (with poor amplitude) and mule kicks. In Melies's version, the unga-bunga moon-men merely waved spears and performed a few pathetic forward rolls. Here in "Excursion", unlike in Melies's film, the five Earthmen are captured by the Selenites and taken to their leader: the "Grand Lunar" in Wells's novel, described but never actually seen by that book's narrator. In both films, ludicrously, the ship makes its return to Earth by being pushed off a lunar cliff and falling all the way down ... an idea made even more preposterous because it's also a continuity error: in both films, the ship is seen to land on a lunar plain, yet somehow it's on a cliff for the trip homeward. The ship is also in left profile for the original moon-shot, yet in right profile for the return. Both films also feature a brief live-action sequence with the (miniature) spaceship dunked into an aquarium, while actual fish (out of scale, but with scales ... and clearly fresh-water species) swim obliviously past it, to depict the ship's splash landing in an ocean on Earth. Because considerable effort, money and talent went into the making of "Excursion to the Moon", I'm surprised that so many resources were expended on what's basically a copy of a previous film, especially since (as I've noted) the original was available for outright purchase. De Chomon shows clear talent and imagination here, so why did he expend them on copying another artist's work? On its own considerable merits, I'll rate "Excursion to the Moon" 8 out of 10, though Melies's original "Voyage to the Moon" rates at least a 9. Many of Melies's films are now lost: if his "Voyage to the Moon" had been one of those, this "Excursion" might now seem more impressive than it is. Review by F Gwynplaine MacIntyre from the Internet Movie Database.